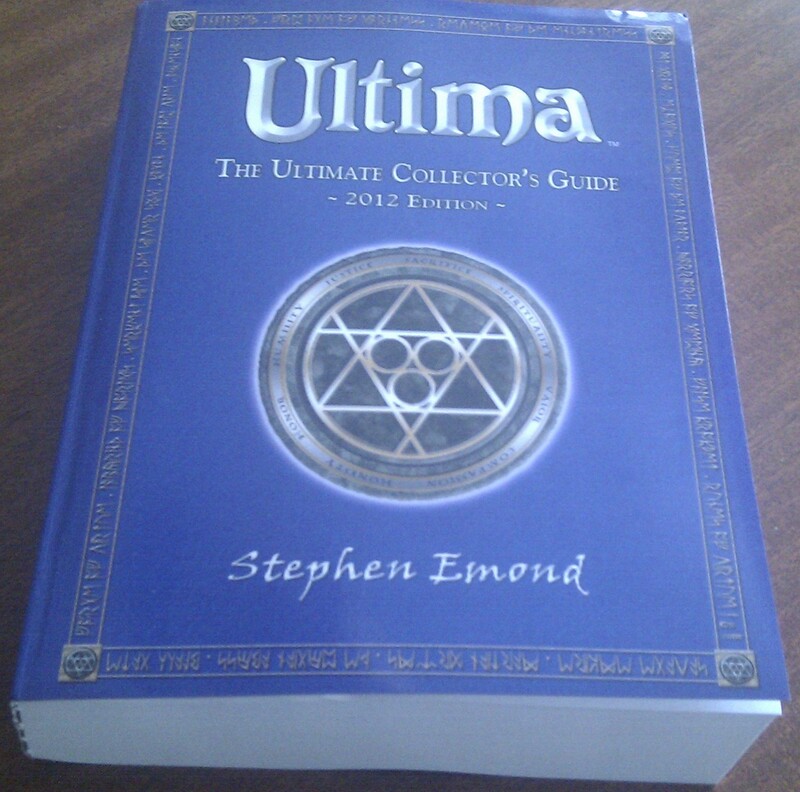 Ultima – The Ultimate Collector’s Guide was written by Stephen Emond and as you might expect is a guide to all the Ultima games, books and paraphernalia every Ultima fan like myself feels a deep-seated need to own. It weighs in at a hefty 826 pages and an even heftier 1973 items. I always knew there was a lot of Ultima out there but this is going some. I thought I owned my fair share but I totalled up that I have maybe 60-70 of the items in here. That’s less than 4% and I’m writing this from a room where the walls are nearly entirely obscured by piles of games. I’m not sure if a guide like this inspires or makes a complete collection look insurmountable. Thankfully, I’ve never aspired to a complete collection. Apart from anything else, I like being able to move around in my house too much. That doesn’t mean that I’m not interested in what is available though and this provides the perfect way to cherry pick and see what I’m missing out on. While doing so, it gives a glimpse into the history of one of gaming’s most significant series. It’s organised by game with each release and variation getting a photo and content list. If you wanted to know what the contents of the Italian budget edition of Ultima 6 were, this is the place to look. Each of the variations of manual and media are covered separately with brief descriptions of the differences. Aside from the games, there are magazine adverts, books, soundtracks, and so on. All the games and spin offs are included, with the exception of Ultima Online which warrants its own book. UO is still covered in brief right at the end but without all the detail. There are check lists for anyone who wants to keep track of what they need to look for. Some of the items included seem a little unfair such as unreleased games and one-off items like the Lost Vale box. Good luck to anyone trying to get hold of anything along those lines. The most interesting items for me are in the miscellaneous category. All the slight variations on games are all very well but there is no way in the world I’d attempt to collect them all. However, who could resist an Ultima 4 writing kit, or an Ultima phone card to pick out 2 from the multitude. As a contributor (purely cash rather than content), I get an added extra book containing lists of everything Origin which I’m just as interested in as the Ultima stuff. This is far briefer and doesn’t have all the photo’s unfortunately but does contain lists of near enough everything Origin that was ever put out. Apparently there was a second Wings Of Glory guide that I’ve never heard about, although I can’t find any evidence of it having searched in the usual places. It’s gone straight to the top of my wanted list. A previously missing System Shock guide is in the post. Inevitably, no collector’s guide can be 100% complete and I would imagine that the mere act of publishing a book like this will draw new items out of the woodwork. Largely thanks to the stuff I picked up before Christmas, I’ve got some bits and pieces that aren’t in there myself. Looking at the monumental list it is hard to imagine that there could possibly be all that much missing though and this is as complete and thorough as you could wish for and then some. Having recently discovered an interest in scouring Japanese auction sites, my main use for the book is going to be identifying all the bits and pieces that come up when I search for Ultima. Assuming I still have a job in a months time (which isn’t a foregone conclusion), I’m planning on something of a shopping spree. 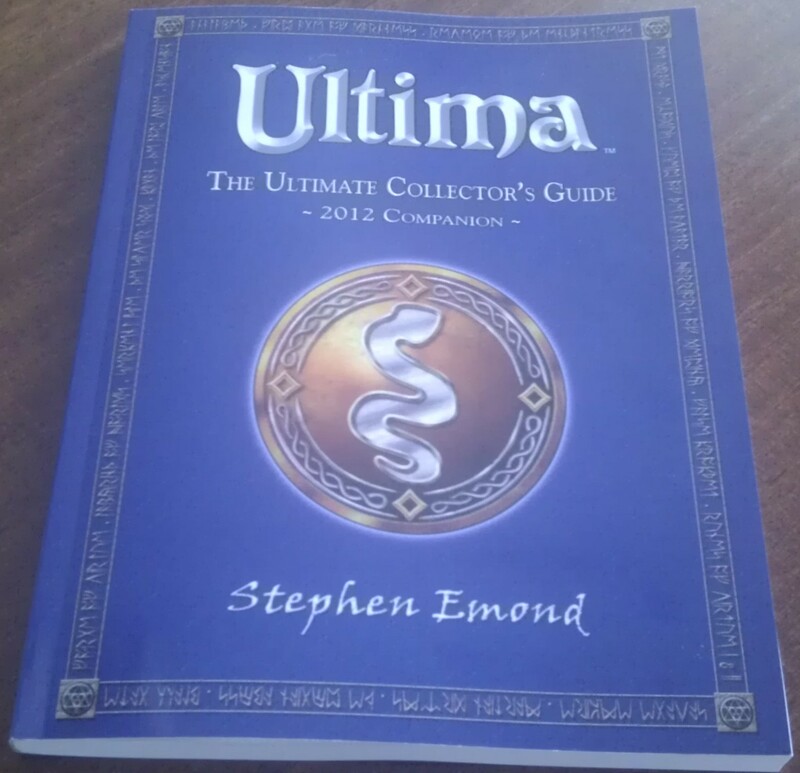 Ultima – The Ultimate Collector’s Guide is a fantastic resource and every bit as collectible as all the items it describes. I can’t imagine the time that must have gone into collating everything and it’s a true labour of love. This is aimed squarely at the collector rather than the casual fan but if the number of people prepared to contribute to the project is anything to go by there are clearly a lot of us out there. It’s not the sort of book you sit down and read cover to cover, and mainly consists of lists but if you have an interest in Ultima it’s a must have. You can pick up a copy from Amazon among other places. It gets 5 out of 5 from Warren Spector himself which can’t be bad as endorsements go.